Can you help design/host events leading up to and including a big SWSC ‘Ceilidh’ in Glasgow in February 2015? SWSC has established a pattern of regular Reference Group meetings. During our first year, these have been hosted by individual pioneer sites. This year, we can build on this with events that more actively seek to cross-fertilise learning. We can build towards a major event in February 2015 and publishing an associated report/resource by April 2015. Dates and times below – please let me know if you’re willing to lend a hand or host (nick.wilding@sssc.uk.com). EVENT 2: November 13th (‘Provisional title: Everything about us, with us’)… interested in co-creating this meeting? How might skilled citizens and workers influence workforce development in the public service? 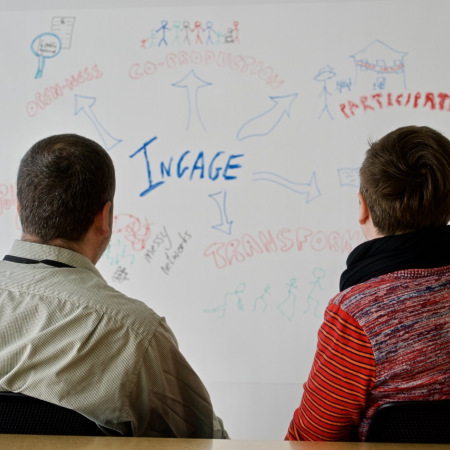 Are you interested in co-creating an event on this and related themes emerging from our network? A rough working title is ” Everything about us, with us” (a positive twist on the phrase ‘nothing about us, without us, is for us’ see for example http://povertytruthcommission.blogspot.co.uk/). First design team meeting August 14th 10am-1pm in the Scottish Recovery Consortium premises, 30 Bell Street, Glasgow. SCVO have offered to co-host a large event (200 people? 500 people?) as part of the Gathering, SECC, Glasgow. I recommend we do this – it seems to me a great opportunity to come alongside some of our third sector colleagues on home turf, whilst bringing our own healthy mix of participants to share, digest and create new learning together – which we can capture as an outcome of SWSC to date. As there is time … we could get REALLY CREATIVE with how this event might look, feel, (smell?). As well as doing some critical friend type story listening/reflection/sense-making, we could mix in fun things like a SWSC band (who else out there knows some tunes? ); doing some kind of participatory theatre exercise to help us experience together what this shift of ways of working feels like in our bones; working with the SECC to make sure a local co-op food supplier can get approved to do some catering… etc etc.. I propose we have our first design/planning meeting in the second half of the next Governance Group meeting (11.30am, September 11th, venue to be decided). During the first year of SWSC, pioneer sites have hosted Reference Group meetings every few months. This time, members of the Scottish Government’s optimists (or assets) network hosted us in the Grassmarket Community Initiative (Edinburgh) – including a fantastic lunch in its brand new facility. In the morning, our group split into two. Seasoned SWSC participants joined a ‘governance’ conversation (Notes from this session will be available on the SWSC wiki pages at www.bit.ly/swschub by 1st August) whilst a parallel session created a real buzz through exercises that offered an introduction to assets approaches. SWSC Reference Group meetings always feature a close-up story of a team or organisation that has/is attempting to put assets approaches into action. This time five members of a policy team reflected on what they remember – and learned – from an experience of attempting to embody an assets approach, how it differed from ‘business as usual’, and how this time has changed their approach to their work as civil servants today. The content of the presentation was offered under ‘Chatham House Rules’, but the team is currently working on creating a resource to share that foregrounds learning from the session. on how the metaphors we use (such as ‘coalface’ and ‘frontline’) shape practice? and on the role for grieving (for old or dying ways of working) in shifting to more assets ways of doing things? We now intend to open a space for these topics and more on September 11th (see above).